A banner with “one cent” across a shield. The 13 vertical stripes on the shield represent the states joined in one union to support the federal government, represented by the horizontal bar above. The bar is inscribed with the national motto "E Pluribus Unum" ("out of many, one"). 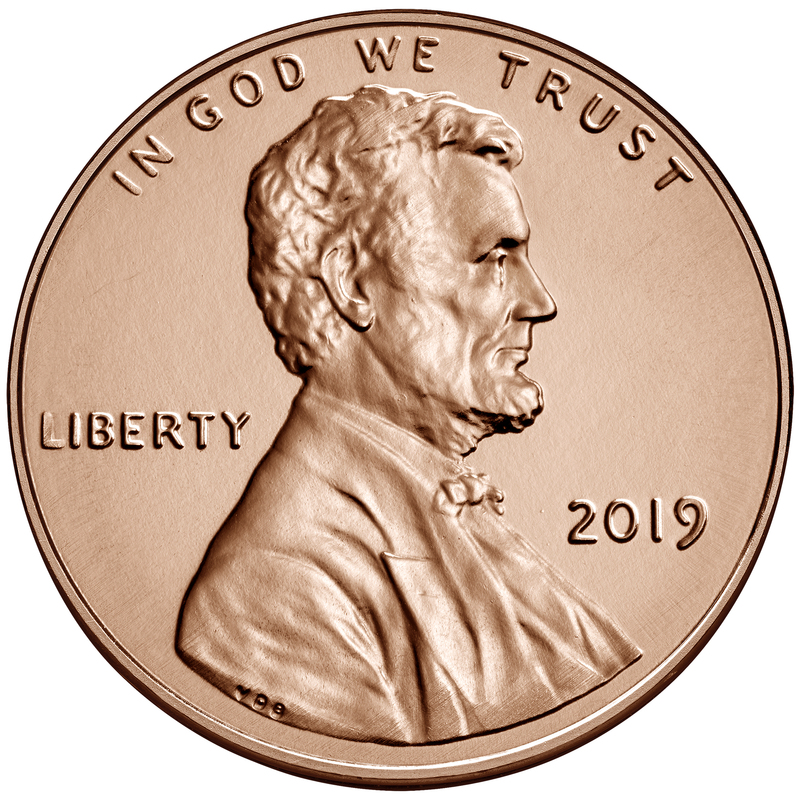 The penny is the United States’ one-cent coin. Every penny you’ve ever spent probably had Abraham Lincoln on it. He’s been on the front (obverse) of the penny since 1909! When the United States Mint was created in 1792, one of the first coins it made was the one-cent coin, but it looked very different from a modern cent. The image on the first cent was of a lady with flowing hair, who stood for liberty. The coin was larger and made of pure copper, while today’s penny is made of copper and zinc. In 1857, Congress told the Mint to make the cent smaller and to mix the copper with nickel. People found the smaller cent easier to use. The new cents showed a flying eagle on the front and a wreath on the back. At the same time, Congress stopped people from using money from other countries, though we had used foreign coins for many years. But the Mint could melt them down and make them into United States coins. The man on our pennies today is Abraham Lincoln, our 16th president. During the time the Lincoln design has appeared on the obverse (front), several different designs have been used on the reverse (back): first a wheat design, then the Lincoln Memorial. Four designs were used in 2009 (see below), and the union shield design first appeared in 2010. As a 2005 law directs, the shield design symbolizes President Abraham Lincoln’s preservation of the United States as a single country. The familiar portrait of Lincoln remains on the front of the coin. The union shield used in the design dates back to the 1780s. This symbol was used widely on coins and medals made during the Civil War, such as the 2-cent coin and the 5-cent “Shield Nickel”. The shield is also featured on the walls of the U.S. Capitol Building, whose halls are decorated with frescoes painted in the mid-1800s. 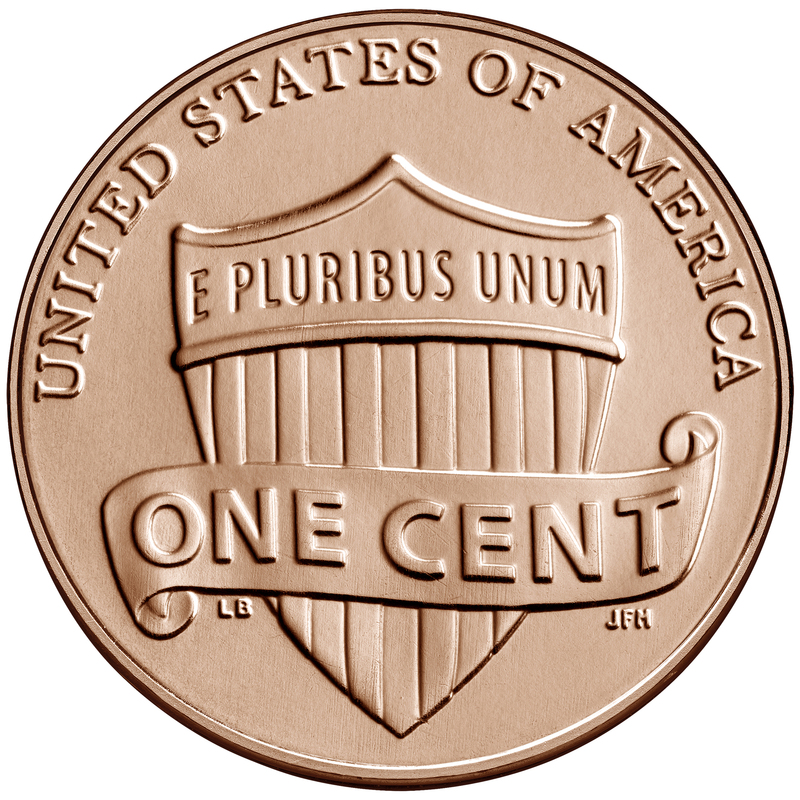 In the current coin design, a banner inscribed “one cent” is draped across the shield. The 13 vertical stripes on the shield represent the states joined in one union to support the federal government, represented by the horizontal bar above. The bar is inscribed with the national motto “E Pluribus Unum” (“out of many, one”).